Lucknow’s own Santa Claus is not well. The winning smile has turned into quizzical wide-eyed gaze. The eloquent, witty orator who could hold huge crowds across the country spellbound now makes futile attempts to mumble something but then raises his hands helplessly and quietly slumps back into his wheel chair. This Christmas, Atal Bihari Vajpayee will be 86. All those politicians and friends, who are still in touch, recall their recent meetings with him to remember him fondly. Says Lalji Tandon, who succeeded him as the local BJP MP, “ He takes his time to recognize you but cannot talk coherently.” Tandon, his campaign manager in all elections, met him just a fortnight ago. He stared at Tandon for a while and then just laughed. “Doctors don’t allow many meetings unless senior leaders turn up”, says Shiv Kumar, his private secretary for 40 years, who still runs the ex-PM’s residential office. “There are 20-30 visitors each day,”says Shiv Kumar. Lucknow has been dear to him always. Here he won five consecutive elections from 1991 to 2004. Just a couple of public meetings on each occasion fetched him huge victory margins. In 2004 he won with a margin of 37% votes against Samajwadi Party’s Madhu Gupta. His electoral opponents have been heavy-weights like Dr Karan Singh, Raj Babbar and Muzzaffar Ali. In 1996 he won from Gandhinagar (Gujarat) also but retained Lucknow as his seat. As an MP from the state capital and as the Prime Minister, Vajpayee indeed proved to be Lucknow’s Santa Claus. Developmental works worth over Rs 25,000 crore guaranteed a new sheen to Lucknow. Most foundation plaques would display his name most projects including four to six-laned highways development, metro or memo rail concepts and projects, a web of power substations, several beautification schemes bear his stamp. For almost two decade (1991-2009) Atalji, as he was fondly referred to, has been integral part of Lucknow’s life. Rajesh Pande, a former BJP MLA and Atalj’s election manager in Lucknow, fondly remembers his famous repartee during 1996 Lok Sabha election campaign. 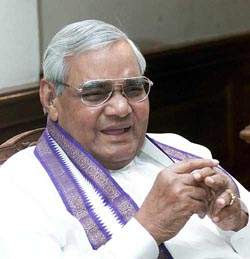 When somebody presented him a garland during his election campaign, “Arey bhai haar nahin, mai jeet lene aayaa hoon…” Vajpayee could devastate his critics with his oratory skills. During 1998 elections Jan Sangh leader Balraj Madhok called Vajpayee a “dual-faced politicians”, a “slippery person”and a “liar” in a campaign meeting in the city. Journalists rushed to Atalji for his reaction. There emerged the well-known mischevious smile, a pause and then, “….wo mere bahut senior hein….” And everybody in the room broke into laughter. Atalji last visited Lucknow in October 2006, this time on a wheel chair. His health was failing but he still campaigned for BJP mayoral candidate Dinesh Sharma, His visit did turn the election in Sharma’s favour. Recalls Mayor Sharma, who met him a month ago, “I will always be indebted to him that despite his physical condition, he campaigned for me.” Present Lucknow MP Lalji Tandon contested and won the 2009 elections on Atalji’s signed appeal to Lucknowites. These days, Atalji’s days, tells Shiv Kumar, are restricted to his Delhi house. Doctors are in attendance of the former PM throughout. He goes through a physiotherapy session in the morning and a general check-up in the evening. He watches TV for a while in the evening a meets senior leaders if there is an appointment. Shiv Kumar says L.K. Advani, Nitin Gatkari, Rajnath Singh keep visiting Atalji. But for infection he suffered in February 2009 for he was put on the ventilator in the ICU of AIIMS, there has been no serious cause of concern. He has lost weight. His responses are dulled and senses are failing. It all is age-related, says Tandon. But the legendary statesman, who could praise Nehru or Indira Gandhi and upset the RSS-BJP cadres, can still smile….